I don't like kids Menus in restaurants. I don't even look at them. The only time I allow them on the table is if they have some games for the children to play while we order our food from the "adult" menu. When my parents came over for Christmas, we went out to one of our favorite restaurants BYOB (Bring Your Own Beverage - small restaurants that don't want to pay for the liquor & alcohol license and for buying a large offering of alcohol beverages allow patrons to bring their own bottles and don't charge a corking fee). As we were waiting inside the restaurant for our table to be ready, a man in his early fifties who was on his way out saw our children and told them "you are going to eat here? You are too young for this food!" We were all in shock! My children did not understand why he was saying that! Obviously, he had a few drinks too many but still, insead of telling them how lucky they were going to be able to enjoy really good food, he just thought that it was a waste of food and money for our children to eat with us. Needless to say that I jumped into the conversation and asked why he thought that they were too young? He did not really took the time to answer me properly; he only mentioned that the sweetbreads were really good. I would not know because we did not order that dish but I can just say that we all had a great dinner... and look forward to going back. Do our children eat everything? No. However, they know that they have to try. It might not be their best dish ever... but at least they try. And more than once as it takes a few good trials to develop and acquire a taste for new textures & flavors. 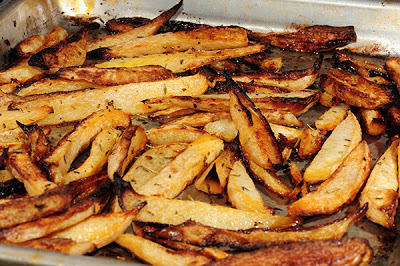 Take the Rutabaga fries I made for us one Sunday evening. Our children tasted them but could not really care for them. I have to say that I am not a big fan of rutabaga either but will I make them again? Yes. Will our children will have to eat a few again? Yes. Will they eat them? Yes. Will they like them? Most likely not. But at least, that evening, I will have managed to make them eat something different. Roast in the oven until golden brown.